Commissioner of Police (CoP), Michael B. Matthews in a comment says further, the force is looking to attract the sharpest and brightest amongst those who qualify. The deadline for applications is April 30, 2019, and the RVIPF notes that employment applications can be found by clicking the RVIPF tab on the Government’s website, www.bvi.gov.vg. 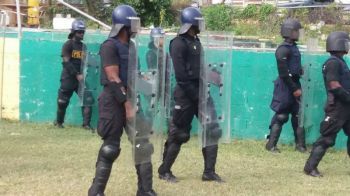 I am calling on the new government, to really assess this recruitment process of police officers in the Virgin Islands. In recent years, I have never seen more recruits, BUT YET there is ZERO police presence on our roads, traffic laws are out of control, crime, etc. WHERE ARE THESE POLICE OFFICERS WE ARE CONSTANTLY RECRUITING?? Also, there needs to be a proper balance with locals and expatriate officers. Indigenous communities, peoples, and nations are those that, having a historical continuity with pre-invasion and pre-colonial societies that developed on their territories, consider themselves distinct from other sectors of the societies now prevailing in those territories, or parts of them. It seems that no one in BVI qualifies for the job, unless you can show me Arawak, native person. In today's sensitive world, it is important to understand the words we are useing. As predominant population of BVI today is desending from the african slave workers broth to VI after they were colonised, the same population is therefore not "indigenous men and woman". I belive that facing the fact that all citizens have the same rights, it would be wise to simply call on citizens of BVI to apply for the job.